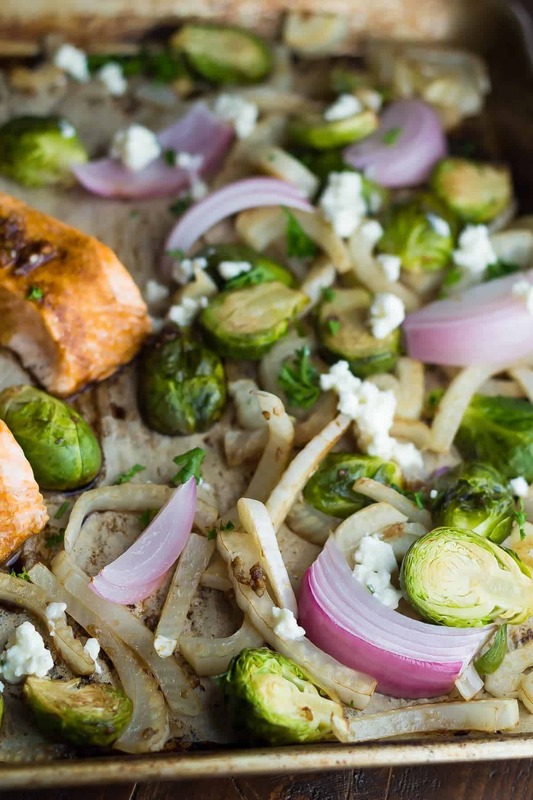 Mediterranean salmon sheet pan dinner with brussels sprouts, fennel, and red onion. Drizzled in balsamic vinegar and sprinkled with feta cheese. Today is a special day around here…Mr. Kai turns THREE! Tomorrow will be a fun day…Kai has been talking about birthday cake for MONTHS, and he practiced blowing out the candles with Nana on her birthday. So I’m thinking the kid is ready. Well, fun birthday plans aside, today is also a special day because it’s 30 Minute Thursday and I get to share this delicious Mediterranean salmon sheet pan dinner with you! Psst! 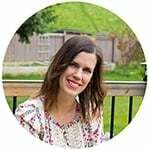 You may be interested in How To Cook Salmon, a post where I share tips to avoid dry, overcooked salmon! I’ve been feeling the sheet pan dinners lately. Did you see this Paprika Chicken Sheet Pan Dinner? Well today’s salmon sheet pan dinner is pretty similar, except with completely different flavors. And ingredients. OK so it’s not all that similar. I went Mediterranean with this one, using balsamic vinegar, plenty of garlic, and fennel. I feel like fennel is an under-utilized ingredient. It’s so good fresh (like this Fennel & Pomegranate Quinoa Salad), and it’s SO good roasted! It gets a completely different flavor profile when it roasts, going from fresh, crunchy, anisey to tender, slightly sweet, and far less anise/licorice flavor. It’s totally perfect paired with Brussels sprouts, salmon, potatoes, balsamic vinegar and feta cheese. So here’s how it goes: everything gets tossed in olive oil, balsamic vinegar and garlic. First, you’re going to roast up your potatoes for 15 minutes. Then you add the salmon, Brussels, fennel and onion, and roast for another 12-15, until cooked through. And enjoy! It’s really that simple. Happy 30 Minute Thursday, friends! Heat oven to 425°F. Line two baking sheets with parchment paper and set aside. Shake together the balsamic vinegar, olive oil, garlic and salt. Toss the potatoes in ⅓ of the mixture and arrange on one of the baking sheets. Bake for 15 minutes, then stir them up and return to the oven. Arrange the salmon on the second baking sheet, drizzle with ⅓ of the balsamic vinegar mixture. Toss the veggies in the remaining balsamic mixture and arrange around the salmon. Bake for 12-15 minutes, until everything is cooked through. Sprinkle with feta cheese and parsley and serve. To prevent overcrowding the pan I recommend using two sheet pans. I just tried this and it was awesome! I made it with asparagus instead of brussels sprouts and baby rainbow potatoes. Literally no chopping, it was glorious! Thank you! Awesome, so glad you liked it Roxy, and hurray for no chopping! Thank God for letting me see your blog :(( I am too tired of eating fast-food everyday, but I do not have much time for cooking and cleaning my kitchen. But, thanks to your post, my dinner today is different. I finally eat something tasty and healthy. Thank you so much for sharing such a helpful recipe!!!! What an amazing comment! THank you so much, Sabrina! Happy belated birthday to Kai!! Hope he loved eating his cake and got spoiled rotten! Can I just say that I’m obsessed with this recipe! I love salmon and then you make it a one sheet meal. SCORE! This is right up my alley. Can not wait to try it out! Happy Birthday, Kai!!! The time really does go so fast, doesn’t it? I love sheet pan dinners, mainly for the easy clean up. 😉 I love that you add feta cheese to this once it comes out of the oven! Happy birthday to your little guy! 3 is such a fun age! 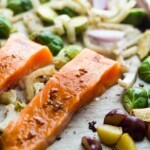 This salmon dinner looks amazing, loving the Mediterranean flavors! Hope your little boy had a wonderful birthday! 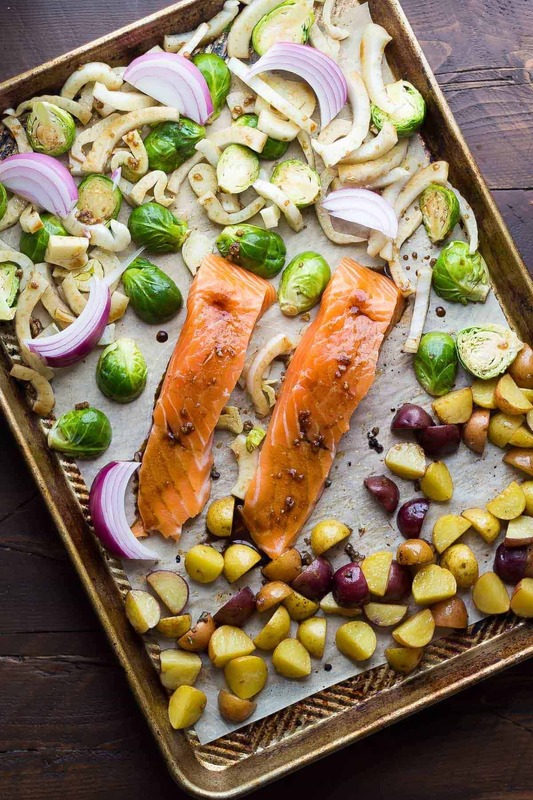 I absolutely love the flavors in this sheet pan dinner! 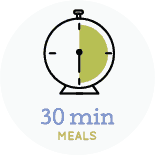 Love your 30-minute meals, Denise, because we like to have 30-minute Monday, Tuesday, Wednesday and Friday too, so I need plenty of ideas! Coincidentally, I’m making something similar to this for this evening’s dinner – I roast Mediterranean veggies, then add the salmon and some cherry tomatoes for the last 10 minutes. Mmm! I love your fennel and feta additions! Aaw Happy Happy Birthday to Kai!! Three is such a fun age! I hope you guys have a great time celebrating and he loves his cake! This salmon looks SO amazing, Denise! Seriously LOVE everything on this pan and yay for fennel! I can’t believe Kai is three already!! I hope he has a great birthday! And this salmon is SO freaking up my alley! Love that it’s an entire meal-in-one so I can spend more time eating it! Happy birthday to Kai! Three is such an adorable age…although mine got a little stubborn. 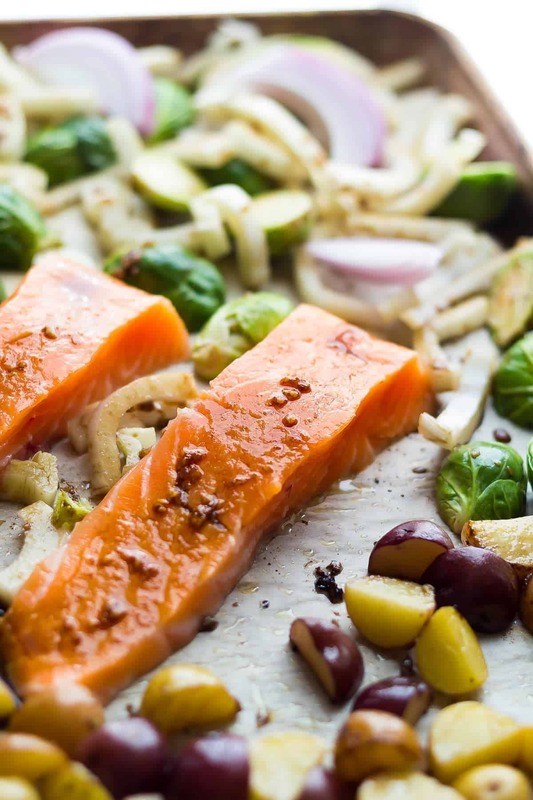 haha I love sheet pan dinners and salmon with mediterranean flavors sounds incredible! Aww thanks Marcie! He’s DEFINITELY stubborn. Like his Mommma. LOL!! Awww…happy birthday to the little man. I’d be pretty excited about having cake with my grandma too, if I was him! :-). I’m totally obsessed with fennel. It’s delicious raw and I could basically just eat an entire bulb like an apple. YUM! I bet it’s great with this salmon! Thanks Liz! He was very upset when he found out he had to share the cake with everyone. LOL! Happy birthday to Kai! He’s at the perfect age for birthday celebrations. I hope he has a blast tomorrow! And yay for salmon sheet pan dinners! This looks SO good, Denise! 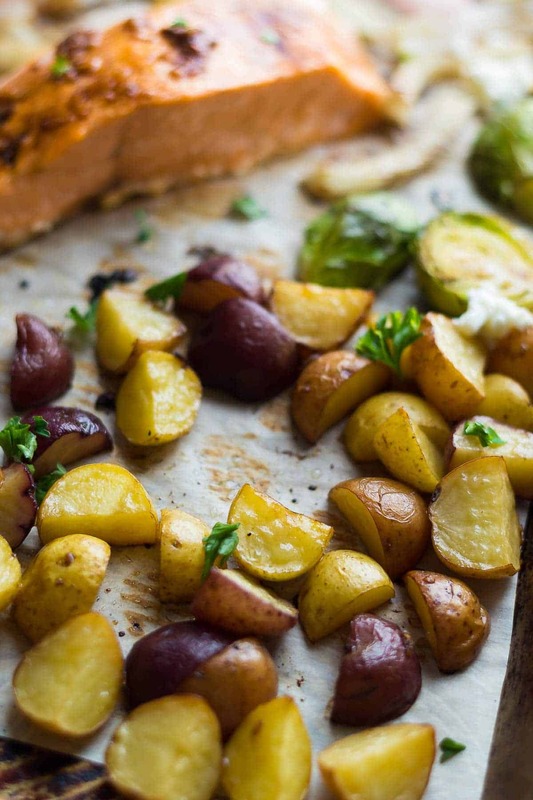 It’s been forever since I’ve made a sheet pan meal, so I’m adding this to my list! Thanks Gayle! 3 is fun…and not fun at the same time LOL. He says some pretty funny things though.